A 50th Anniversary is special. 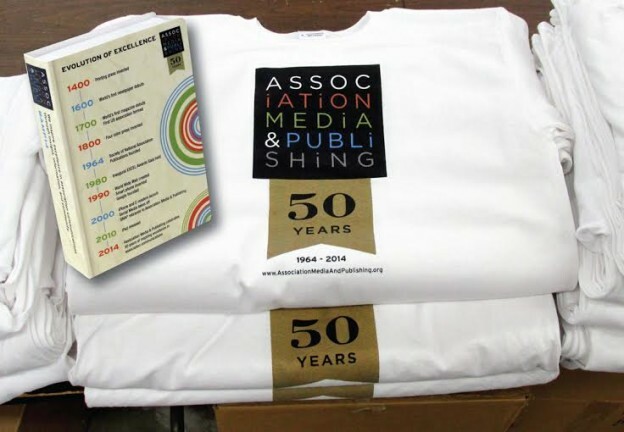 The Association Media & Publishing group just celebrated their 50th at their annual conference in Washington DC. They commemorated it with a “book” telling their story and with a surprise inside. It was a great way to kick off a buzz about the show and the association, with a history of their timeline on the front cover. The surprise was a compressed T-shirt inside the package. “We’re doing this for our association” was the response of some members as they arrived at the BookWear® exhibit booth to learn more. Association Media & Publishing members are media savvy. They know when there’s innate punch to a new media! The conference was attended by members from all over the US and everyone received their commemorative “book” at registration. 650 colleges and universities use BookWear® for college recruiting, marketing and PR. So do hundreds of hospitals, nonprofits and corporate customers.